Mike Powell, Skate Guru from K2 Skates and Rob Gill, of InlineSkates.com, review the 2015 K2 VO2 90 Pro Mens and Womens Inline Skates. Hey, welcome to the Daily Spin. I'm Rob from inlineskates.com joined today by Mike from K2. Mike, thanks for being here. Hey man, thanks for having me. So, we're talking about the VO2 90 Pro women's and men's skates from K2. Fantastic skates, a really nice performance skate in the K2 lineup. What's the first feature with this skate? Well, it all starts with the Original Soft Boot. 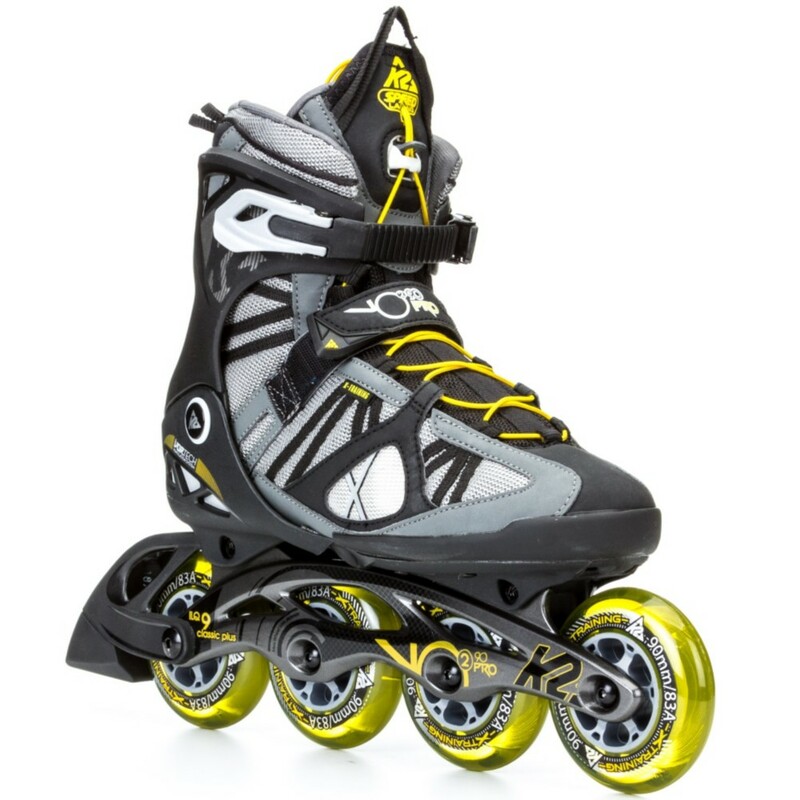 It's a patented technology that K2 has developed and it's really how we build our inline skates like a piece of high performance footwear and you can try any kind of inline skate out there on your foot, nothing fits like a K2. For sure. So, let's talk a little bit about the cuff and closure system on this skate. So, you get the Stability Plus Cuff so you've got a lot of support here for a skate with big wheels and then you move onto the K2 Speedlace system which is just, you know, you pull out the little toggle right here. Here's your Speedlace coming right out and you're able to just close the skate by pulling down and then you wind this up, put it back in it's pocket. And you are good to go. you can shift on the fly as well, you can tighten this while you're skating at 20 miles an hour and it just makes things easy. Fantastic. So, moving down the skate. Aluminum frame, 90mm wheels and a little bit of an upgrade in the bearing here too. Yeah, so you're getting a longer frame than you get on your fitness skates so what that does for you is that allows you to carry higher speeds and you're going to be a little bit more stable at speed. Then you go with that 90mm wheel and the ILQ9 Classic Plus bearing and you've got just a performance machine. I look at this skate as the best of both worlds. You've got the long frame length like you'd find on your high-end training skate. Then you have your ultra supportive cuff that you find on your fitness skates so it's a hybrid, it gives you the best of your fitness with the support that you get, the best of your training skate with the longer frame lengths - it's a whole lot of fun. For sure. And now this skate, I mean this is a skate you're going to be doing some longer distances and maybe one of the most important features on it is the ventilation system on this skate. For sure. We've got a Vortech Ventilation System. You're probably wondering, What is a Vortech Ventilation System? Well, I'll tell you. It's a series of channels and grooves that go underneath this skate and you've got intakes in the front of your skate, you've got outtakes in the back of your skate, or exhaust in the back of your skate, what that's going to do when you start going faster, more air is going to channel through the bottom of your skate, your foot's going to stay dry - there's nothing worse than skating in a wet, sweaty sock and we've eliminated that with the Vortech Ventilation System. Fantastic. So, who is this skate for? This is for your more serious skater. Someone who has taken skating and has made it one of their primary workouts. They're going out on the trail, they're going to log 10 miles at least at a time, they're going out there, they're trying to go really fast and have a lot of fun but they still want the same ankle support that they get on their fitness skate, from their fitness skates, with the longer frame length of their training skate. Perfect. So, there you have it - the VO2 90 Pro women's skates and men's skates from K2. You can check them out on inlineskates.com and thanks for joining us on the Daily Spin.